QR codes are such a fantastic resource for students – especially those who need a little extra support. 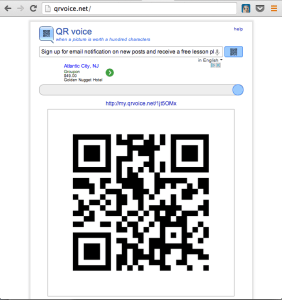 QR voice is a free web tool that truly makes your QR codes start talking! You can type a sentence into the text box on their website (100 characters or less) and QR voice will generate a QR code for you that turns your short message into an audio file. As soon as the QR code is scanned the message will be spoken aloud for students to hear. You can include this QR code on any activity sheet to give an instruction or reminder, provide the definition of a new word, or offer a helpful hint to struggling students. It’s a simple tool that can go a long way! Check out my Udemy course: Using QR Codes in the Classroom: Differentiate and Energize Your Lessons!